Mary long reigned as the undisputed #1 name for girls of ages, rich with history and meaning. Our Baby Name of the Day is an enduring favorite that might be ready for a comeback. In the Old Testament, Miriam appears, older sister to Moses. 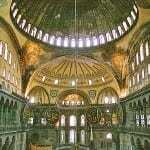 The New Testament opts for the Greek Mariam, but they’re both forms of the same name. Possible meanings abound, including bitter, rebellious, wished for child, and beloved. Unraveling the origins of such a storied name proves challenging. Beloved comes from the Egyptian mr. I’m not clear on some of the sources for the other meanings, but they’re oft-repeated. The name became Maria in Latin, and Mary in English. For nearly anyone, there’s one immediate association: the Virgin Mary, Mother of God. Ave Maria. Our Lady of Too Many Things to List. It’s nearly impossible to think of a name more strongly associated with a single figure. Except that it’s been given to so many women that it feels universal, too. One of those many Marian associations is the sea: Stella Maris literally means “star of the sea.” The Latin mare means ocean. While it’s almost certainly folk etymology – a meaning that attached later, thanks to shared sounds – it’s easy to imagine parents choosing this name in part because of their love of the ocean. At some moments, this name was considered too holy to be bestowed upon a child. And, at other times, there were simply so many Marys that it was tough to keep them straight. So we find choices like Pilar, Soledad, and Guadalupe – sometimes given with Maria. In French, names like Marie-Josephe combine a feminine with a masculine, while others combine two traditional choices, like Marie-Elise. In English, combinations like Marianne flourish. When combined with Elizabeth or Katherine, we get Mary Beth and Mary Kate. Because many women were given the name, but actually used something different in daily life, it’s possible that the name’s long-time status as #1 pick is slightly more complicated than it first appears. International forms of the name abound, along with nicknames and variations. There’s Marijke and Mariska, Moira and Manon. Maja claims independent roots, but also developed as a short form of Maria. Nickname Molly has ranked higher than the original in the US in recent years. And elaborations like Mariette have been heard over the years, too. Factor these back in, and maybe the name does count as the most popular choice of the last century. Mary reads as a good girl name, but it’s a gutsy one, too. Besides Jesus’ mother, there’s also Mary Magdalene. She’s a saint in her own right. Some characterize her as a prostitute, but modern scholars see her in a different light – a loyal follower, and a thoroughly complex figure. Legend says that she eventually made her way to Provence, converting all of the region to Christianity. European royals have embraced the name, including two queens of England. 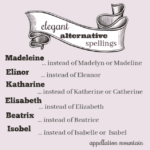 Add in Marie and Maria, consider queen consorts and princesses, and the ruling houses of Europe have been quite fond of this name for centuries. Anne Boelyn’s sister answered to the name. The current crown princess of Denmark was born a commoner in Australia, but will someday be yet another queen by the name. The quite contrary gardener of nursery rhyme fame, as well as the keeper of a little lamb. Hollywood gives us the legendary Mary Pickford – born Gladys – and the Cameron Diaz hit, There’s Something About Mary. Creedence Clearwater Revival penned a song about a riverboat called “Proud Mary.” Ike and Tina Turner scored a hit with it later. The Monkees released a song by the name in 1967; 21 years later, Run-DMC covered it. Screen legend Mary Pickford, born Gladys, along with many other actors over the years. Don’t forget artists Blair and Cassatt, writers Wollstonecraft and Shelley, singers J. Blige and Travers, folk musician companion to Peter and Paul, and television legend Tyler Moore. The list is endless, and I’ve omitted dozens. In 2010, we met another aristocratic bearer of the name: the eldest Crawley daughter of Downton Abbey. Often haughty and cold, over the course of the series, she also proved herself strong-willed and capable. The series has boosted Cora and Marigold, but so far, not Mary. Now rumor has it that the name is a strong possibility for Will and Kate’s third child. If that should happen, then a revival would almost certainly follow. Mary: Fading Fast or Ready for Revival? And revival is exactly what this name needs. we dismiss it as too common. Maybe that’s true if you’re a Baby Boomer. But for babies? Natalia, Everly, Willow, Serenity, and Skylar all rank higher. Unbelievable as it seems, Mary now makes for the uncommon choice. The name ranked in the US Top Ten into 1971. But it’s fallen sharply since then, reaching a new low of #127 in 2016. But that’s the name’s strength. Like Lucy, Ruby, Ivy, and Lily, it feels short, straightforward, and yet clearly feminine. And now that every other house on the block doesn’t have a mom or daughter with the name? It might be time to consider this a classic, fresh choice for a girl, one with scores of notable namesakes and built-in lullabies. What do you think: is Mary ready for revival? This post was published originally on December 25, 2012. Following substantial revision, it was re-posted on Wednesday, March 28, 2018. I love the combo Mary Rose (the name of King Henry VIII of England’s famous warship). I still adore Mary. It’s the name of one of my oldest friends. My mil is a double-barreled Mary; she’s Mary Lou. Since she’s always gone by both, it’s hard for me to think of her as a “Mary” though. There’s also a 5-year-old Mary in my building. She’s certainly the only young Mary I know. Abby, do you know about Five Marys Farm? Parents Brian and Mary have 4 girls with double-barreled Mary names. The girls all go by a nickname associated with their 2nd name. Yes, they were on Design Mom! I think it’s almost ready … I’m expecting many of us to have granddaughters named Mary. It’s been my daughter’s favourite name forever and she’s 11. I love Mary! I think it’s even better with an unexpected nickname! Since my step-kids went to Catholic grade school, it seems like several of the girls were Mary Samantha or Mary Mckayla… all but one went by their middle name. I was always disappointed to hear one of these girls complaining about their OMG BOORRRING! first name. 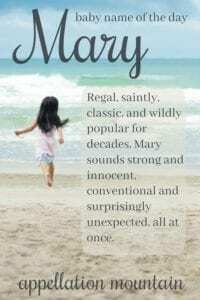 While my daughter is totally a Maria, I love the uncomplicated Mary. I love the classic simplicity of Mary. Spare and beautiful. Thank you Abby for another wonderful write-up and for brightening up name nerds’ days everywhere throughout the year. Mary is quite the fitting name this Christmas Day. I believe I only know one young person with this name – I would say she’s about 10 or 12. I quite like Mary, in theory. It looks good on paper, it is a solid classic name. However, I hate hate HATE the way it is said here (in Australia) by the majority of Aussies. I am a fan of this name. People see it as common, but it’s rarely used anymore so I think it’s due for a comeback. I also wonder if William and Kate have a daughter and name her Mary (possible but not certain), how will that affect the popularity of the name?